Relaxed and highly personable, Schiller bantered amiably with the audience while presenting three of his games against Emory Tate. There’s an ancient Hebrew proverb that goes something like, “The Rivalry of scholars advances wisdom.” And such was the case of the rivalry between Eric Schiller and Emory Tate. 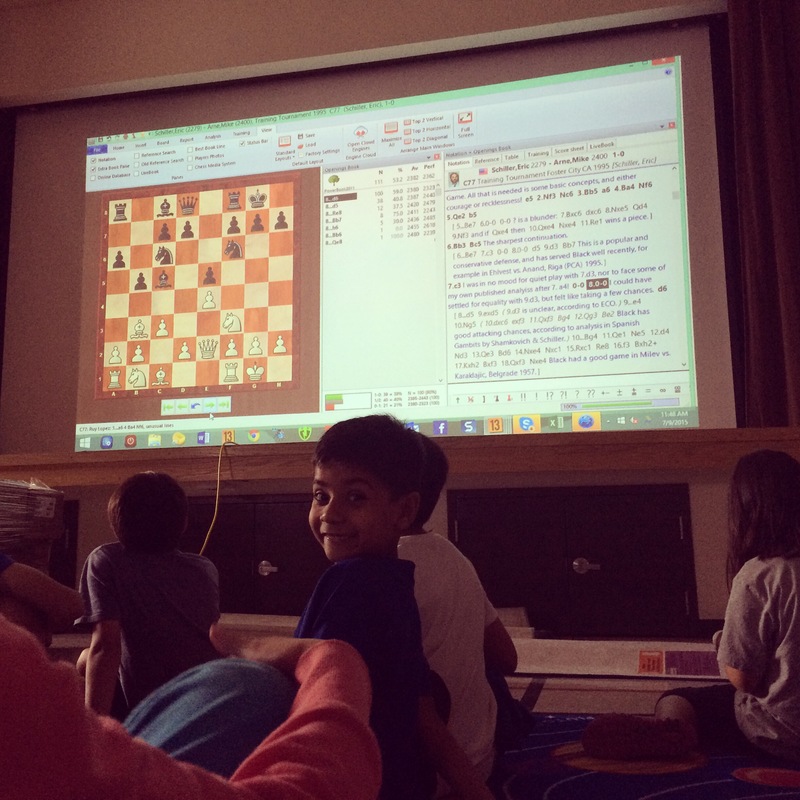 So it was a very special occasion at the Fremont Summer Chess Camp when when Eric Schiller did a two-hour lesson on his three games against Emory Tate while Tate was in the room to interject his opinions. To this day, I still receive “thank you’s” from the young chess players in the room who greatly benefited from the wisdom of these two masters. 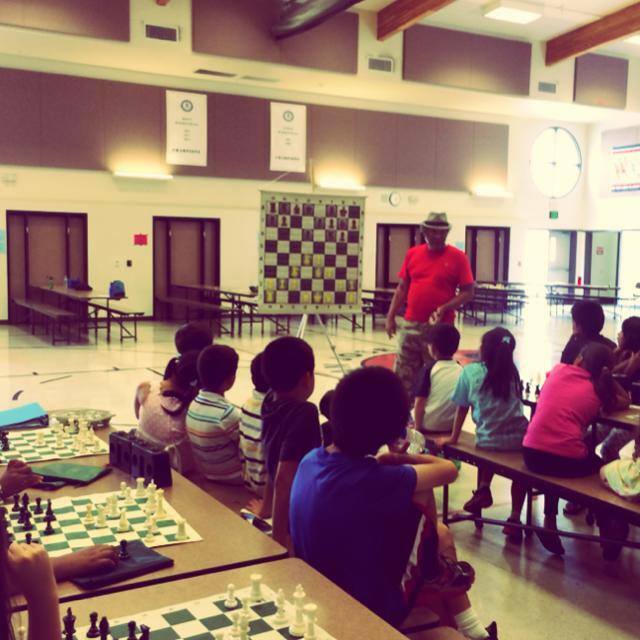 Emory Tate inspiring the next generation at the Fremont Summer Chess Camp. 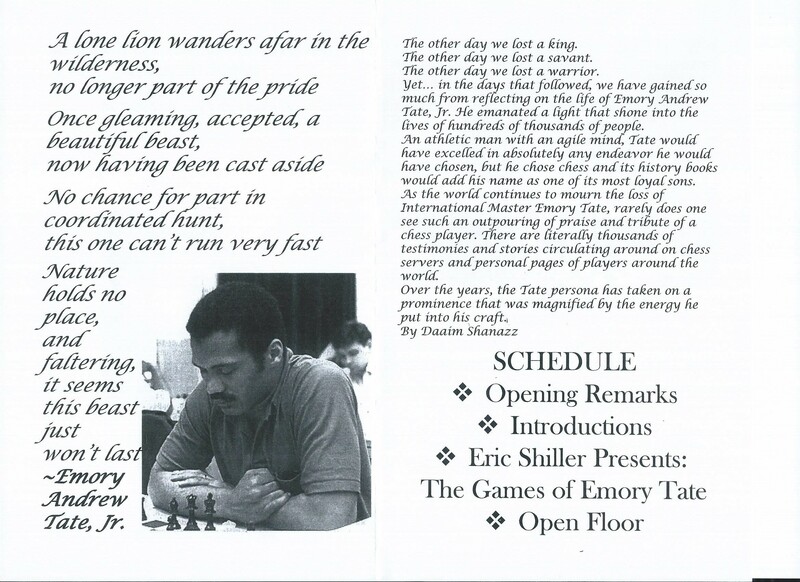 Below is part 2 of the trilogy of chess battles between Eric Schiller (March 20, 1955 – November 3, 2018) and Emory Tate (December 27, 1958 – October 17, 2015) with notes by Schiller. In 2018 I lost a good friend and excellent coach, Eric Schiller. Eric was a true gentleman and scholar who during his journey through life acquired a PhD in Linguistics and FIDE Master title in chess. Most will probably remember Eric as the most prolific chess author in history (he wrote over 100 chess books) or for being the arbiter for the 2000 FIDE World Chess Championships. I will always remember Eric for the way he inspired scores of chess students at our chess camps and classes. Some of Eric Schiller’s books on display at a chess camp. Today I had the sad honor of hosting a memorial event for International Emory Tate. This West Coast tribute to Emory was attended by many of his best friends and students. It was an inspirational afternoon and everyone who attended left with a better understanding of the man we were fortunate to befriend. At the end of the event, I announced a Torres Chess and Music Academy Scholarship in Emory’s name and also pledged to help Eric Schiller keep Emory’s memory alive through a new book about his life and games. I am deeply grateful to Janine Tate, James Paquette, Eric Schiller and Achiever Institute for their fantastic job helping me to organize such a moving tribute. We still have two more weeks of chess classes. 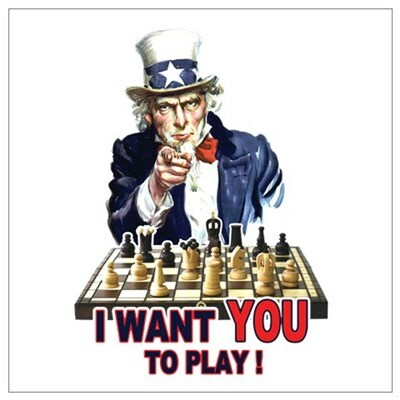 Sign up for the Fremont Summer Chess Camp by clicking here. 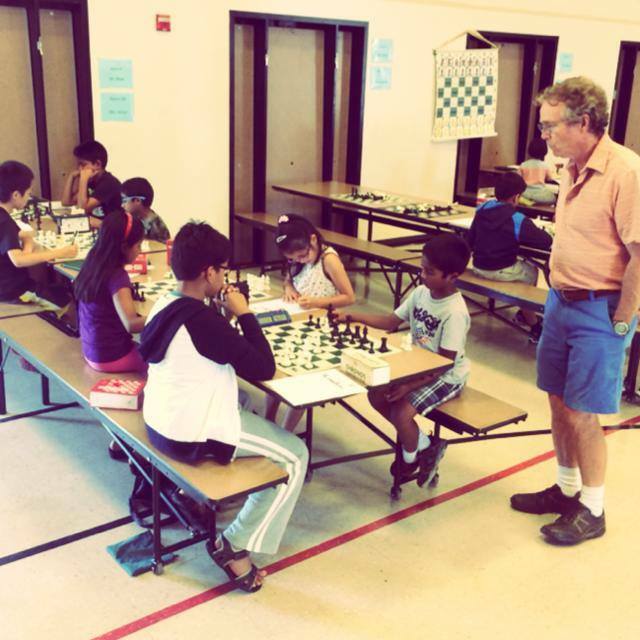 On Monday July sixth, the Fremont Summer Chess Camp welcomes world famous chess coach Jay Stallings. Coach Jay founded the highly regarded California Youth Chess League in 1996, authored the popular “Fried Liver & Burning Pants: Curious but True Chess Stories,” and created Coach Jay’s Chess Academy App which is far and away the best hi-tech learning tool available to scholastic chess players. *After their classes, both Coach Jay and Master Schiller will be available for autographs and photographs with camp attendees. 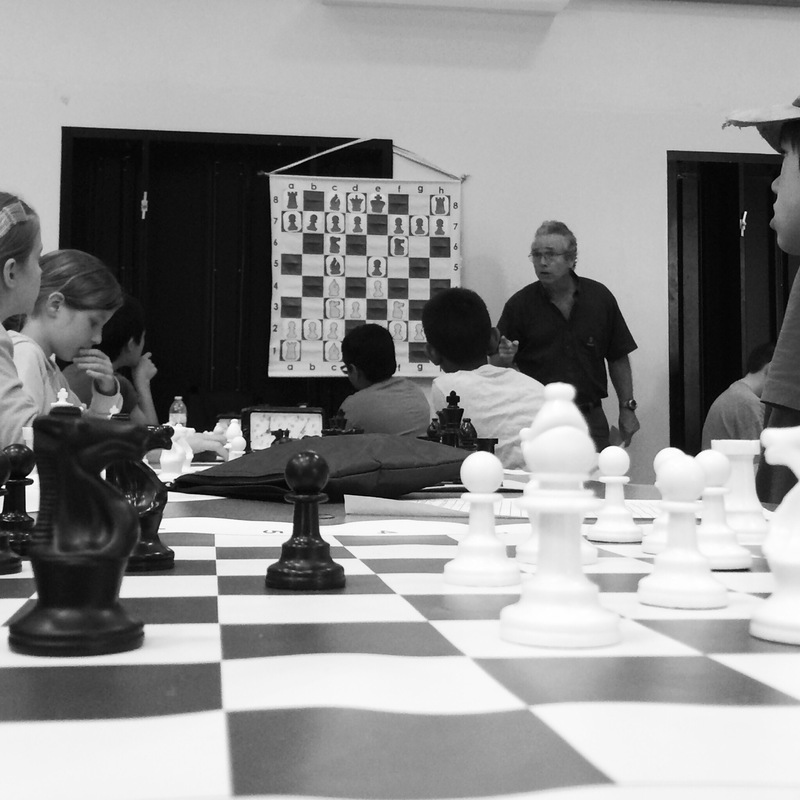 At the Fremont Summer Chess Camp, your child will live and breathe chess while our elite coaches provide them with the most incredible educational experience available. In addition, our camp includes supervised recesses which feature basketball, soccer and art activities. 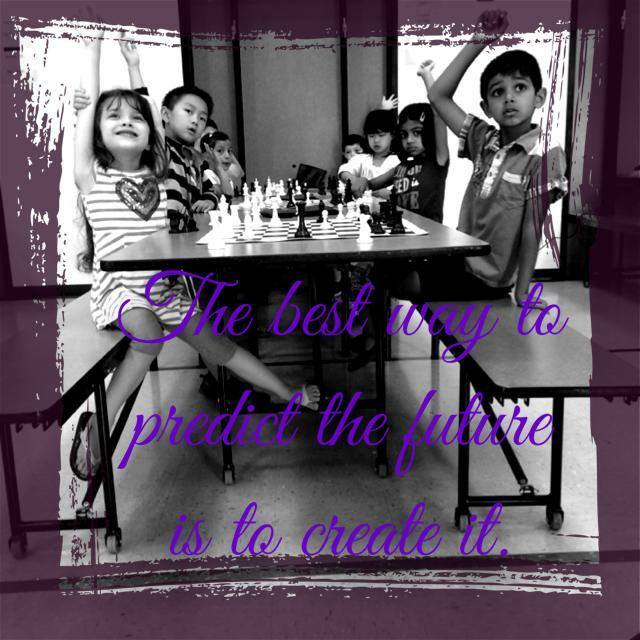 Your child is guaranteed to have a blast while training with the 2015 National Elementary Chess Championship Team at Mission San Jose Elementary School! At Mission San Jose ES 43545 Bryant St. Fremont, CA. 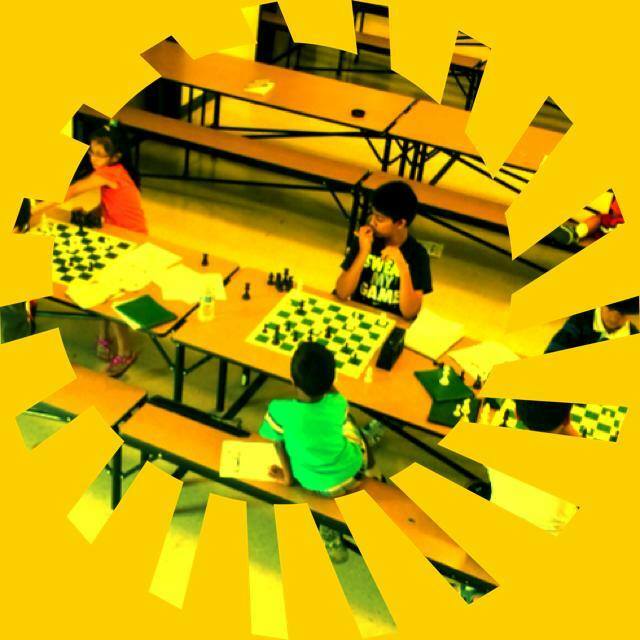 Summer is rapidly approaching and that means it’s almost time for the annual Fremont Summer Chess Camp at Mission San Jose Elementary School in Fremont, California. 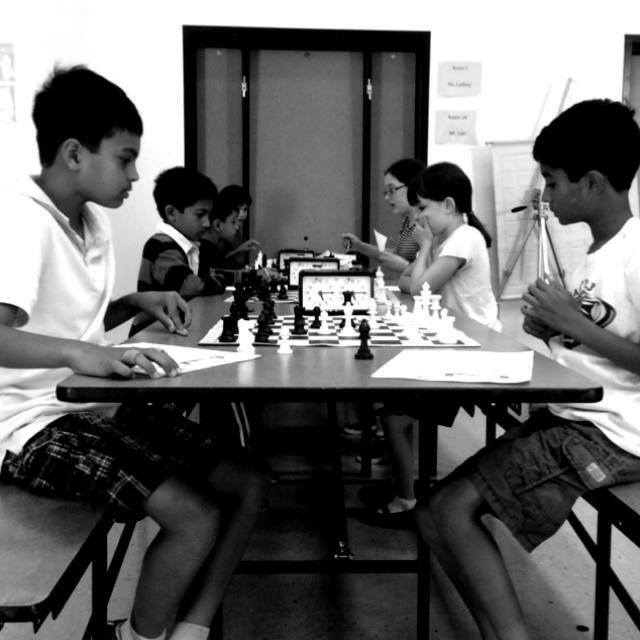 Our summer chess camp features coaches with decades of chess teaching experience who annually create a summer camp that is fun, competitive and educational. All camp attendees will receive the best chess training available and take part in USCF rated tournament with awards given at the end of each week. So why not kick your summer off by saving 10% off of tuition and receiving one of several “thank you” gifts just for signing your child up for the chess camp hosted by the school that just won the 2015 USCF National Elementary Chess Championships? The TCAMA’s Memorial Weekend Sales Event is the best time to register your child for the Fremont Summer Chess Camp. 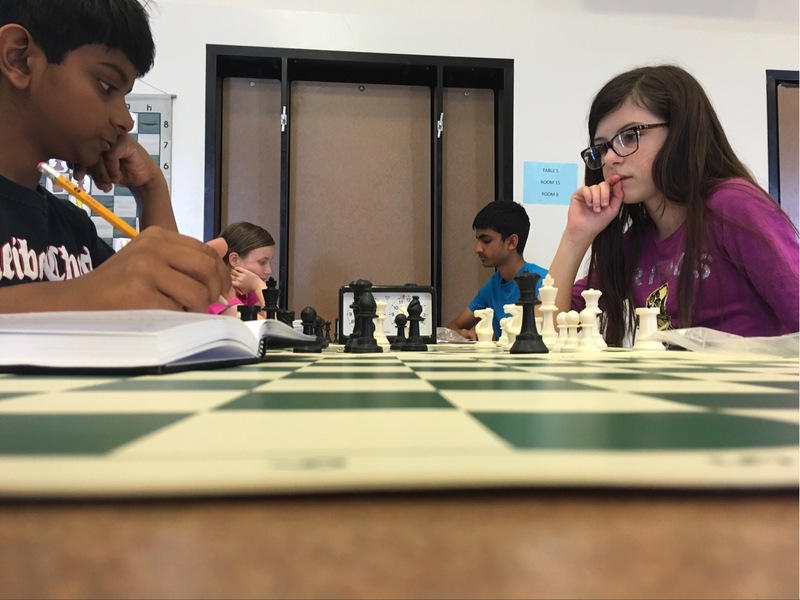 Sign up for one week by May 25th and your child will receive a free private lesson with a TCAMA chess coach prior to the start of the chess camp. 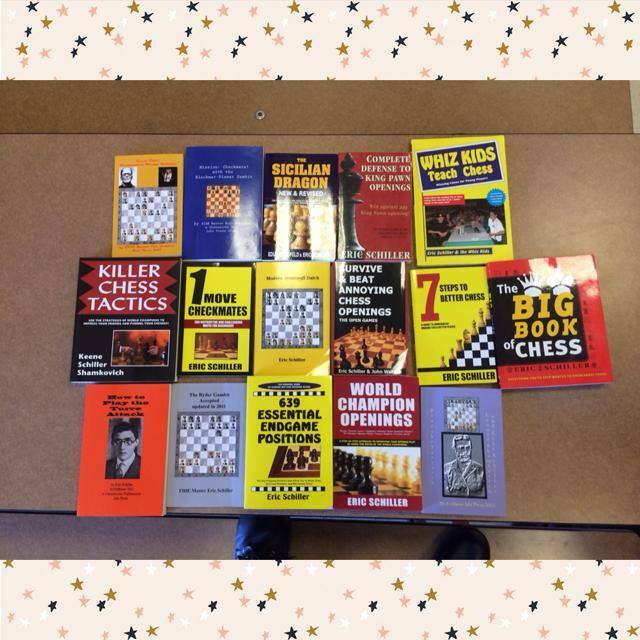 Sign up for two weeks of camp and you will also get a copy of Chess Tactics for Champions by our friend Grandmaster Susan Polgar at your child’s free private lesson. Finally, if you sign your child up for three or more weeks of the Fremont Summer Chess Camp, he/she will receive the free lesson, book and a deluxe triple weighted set of tournament chess pieces! *Joe Lonsdale – Head Coach of the National Champions at MSJE! Even better, because all of these chess coaches work full time in the Bay Area, your child can continue to seek guidance from our highly accomplished staff at all of the big scholastic tournaments held in Northern California. 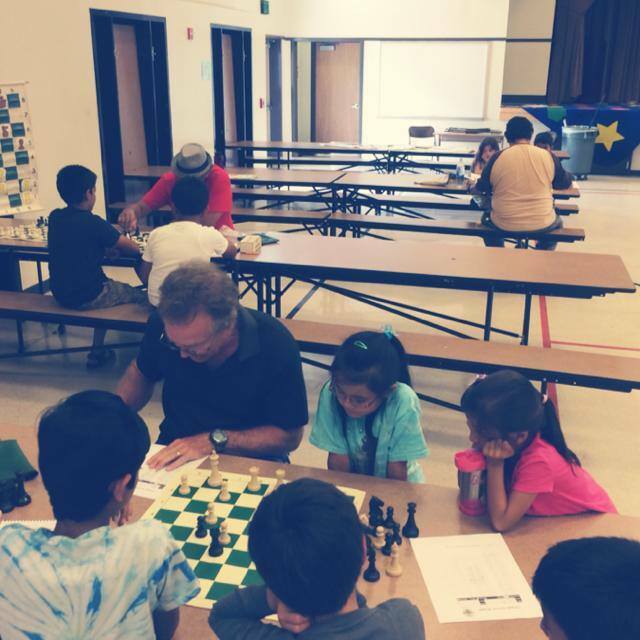 Join us at the Fremont Summer Chess Camp located at Mission San Jose Elementary School in Fremont from June 29th through July 23rd. Remember to sign up by May 25th in order to receive a 10% discount and claim a special “thank you gift” for your child. For more details and to register online, please visit www.ChessAndMusic.com and I’ll see you at chess camp. P.S. Don’t forget to be sociable and share this incredible offer with your friends. 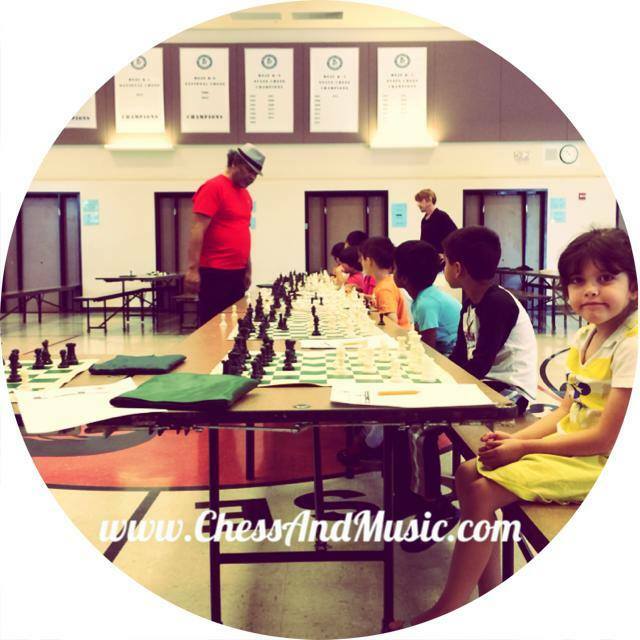 The Torres Chess and Music Academy describes their latest event in the esteemed guest series for the Fremont Summer Chess Camp. 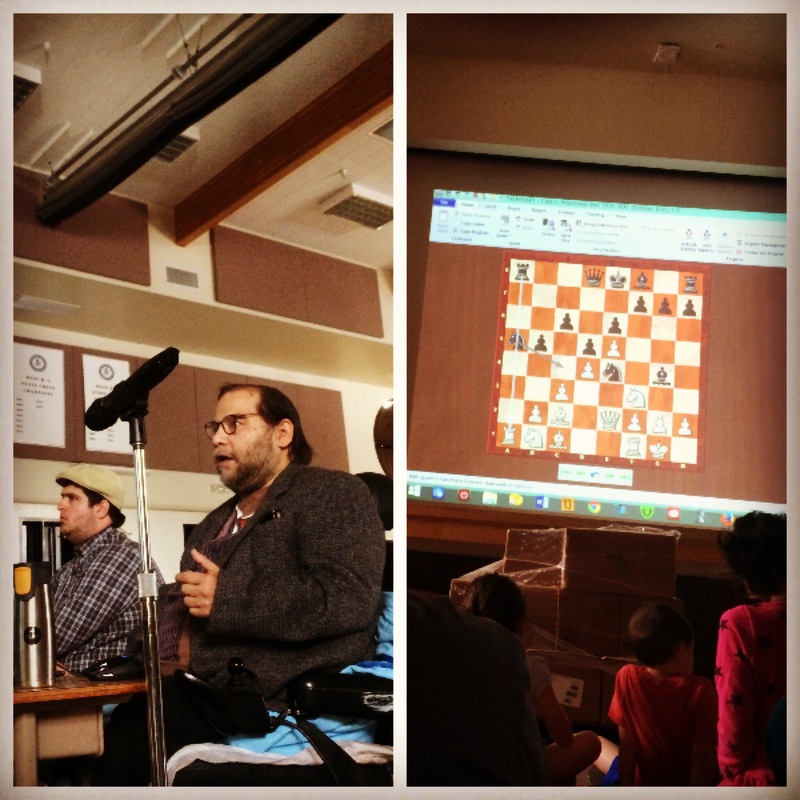 This past Thursday, chess master Eric Schiller came to guest lecture the students at the Fremont Summer Chess Camp. Having written two hundred top selling chess books, it’s a rarity for Eric to have time to perform in person. 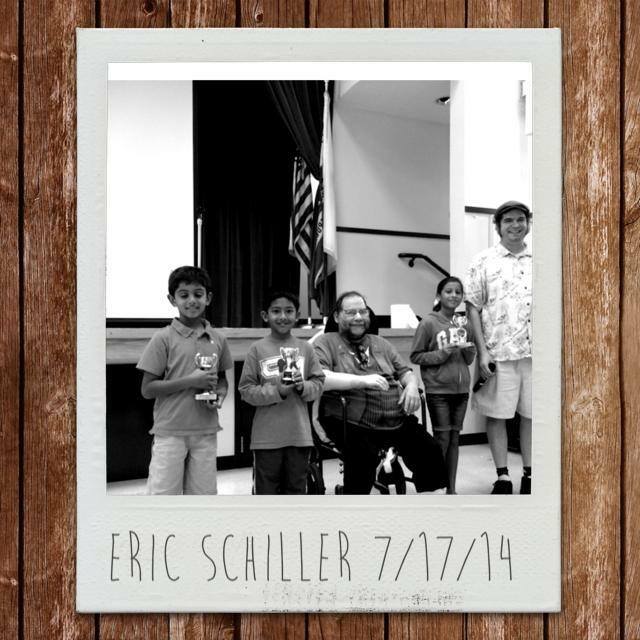 However, on July 17th, Eric Schiller managed to steal the spotlight at the sixth annual Fremont Summer Chess Camp. Relaxed and highly personable, Schiller bantered amiably with the audience while presenting seven of his most exciting chess victories over famous adversaries. Perhaps the liveliest moments came during Eric’s analysis of his victory over International Master Emory Tate, who was also in the room. 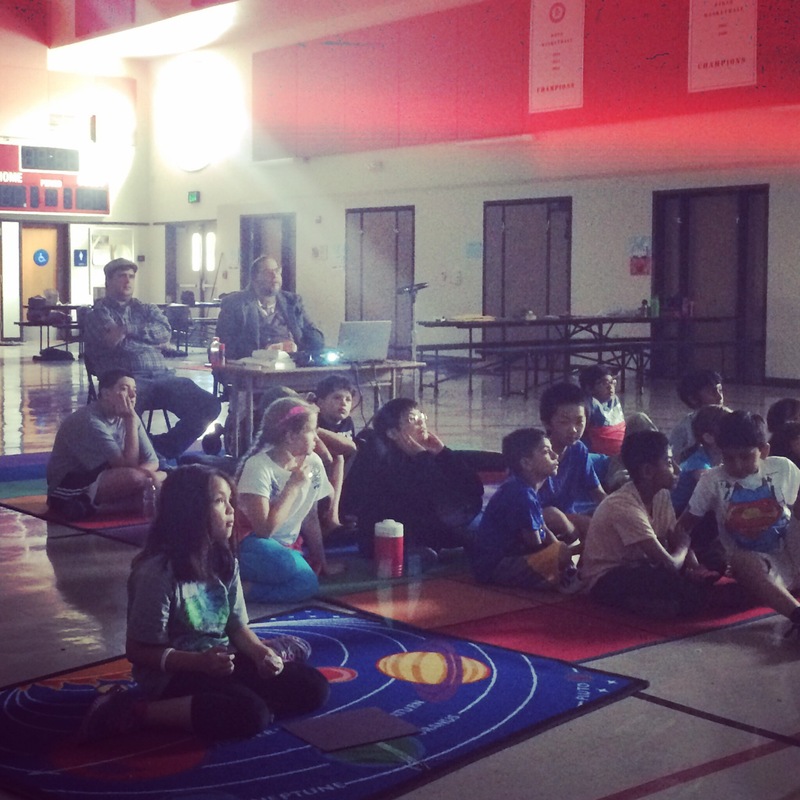 Every child in the room had their eyes glued to the massive movie screen where the ideas of Schiller and Tate came to life in vivid detail while the stars of the game explained their moves in depth. Eric Schiller’s presentation was highly polished and even in between games he managed to maintain the focus of close to fifty excited young chess players. 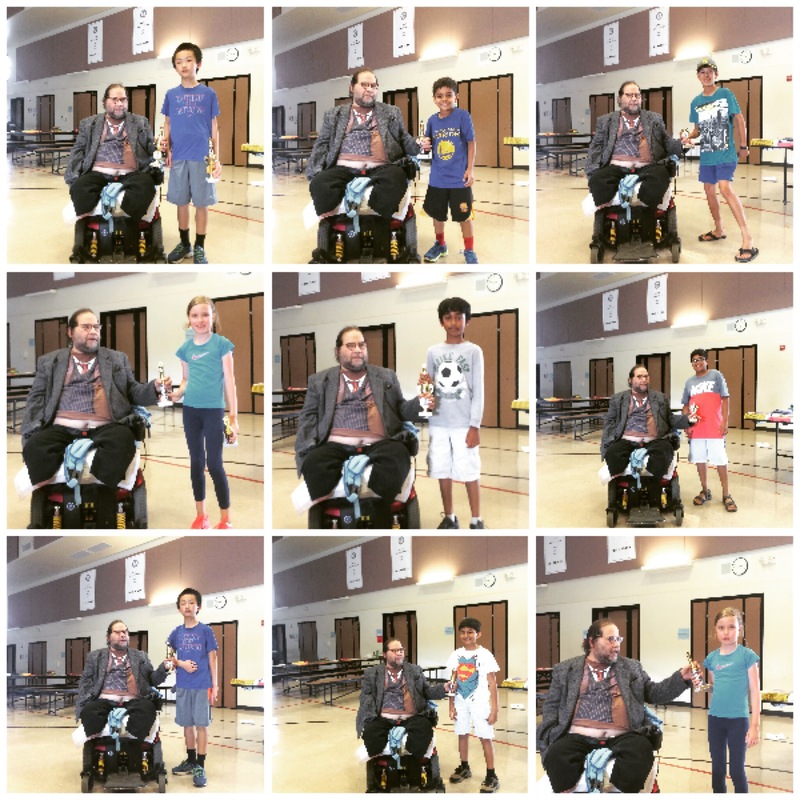 At the conclusion of his lecture, Eric graciously awarded trophies to the winners of the weekly rated chess tournament as well as signed chess books for the scores of his young fans. Relaxed and highly personable, Schiller bantered amiably with the audience while presenting seven of his most exciting chess victories over famous adversaries. On July 24th the Torres Chess and Music Academy will be presenting Grandmaster Susan Polgar to the Bay Area. Single day tickets as well as full week camp subscriptions are still available. More information on the Torres Chess and Music Academy’s esteemed guest series can be found at www.ChessAndMusic.com. 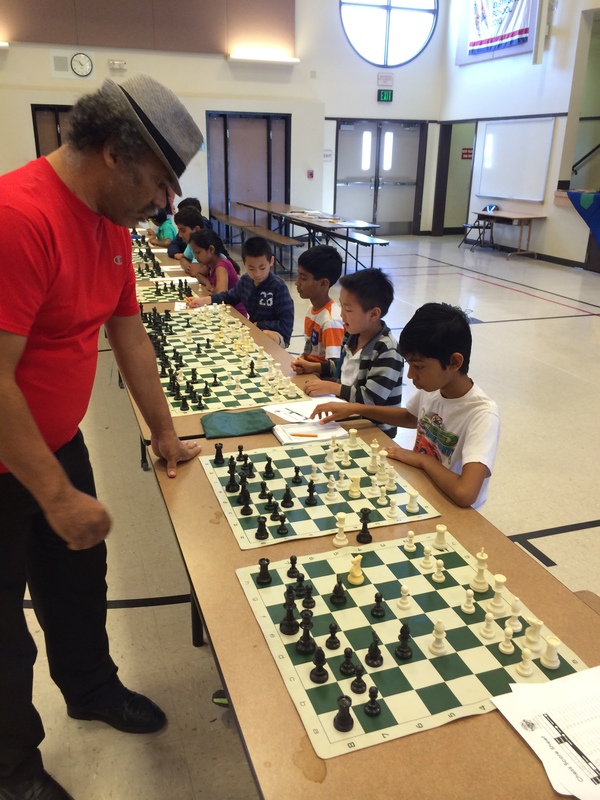 International Master Emory Tate stunned the Bay Area’s best young chess players by achieving a perfect score in a massive simultaneous chess exhibition at the Torres Chess and Music Academy’s Fremont Summer Chess Camp. For all those unaware of what a great chess player International Master Emory Tate truly is, the Torres Chess and Music Academy recommends playing through his recent win over Grandmaster Maurice Ashley in just 22 moves! For the children who participated in his simultaneous exhibition chess event on July 10th, Emory has achieved a legendary status. 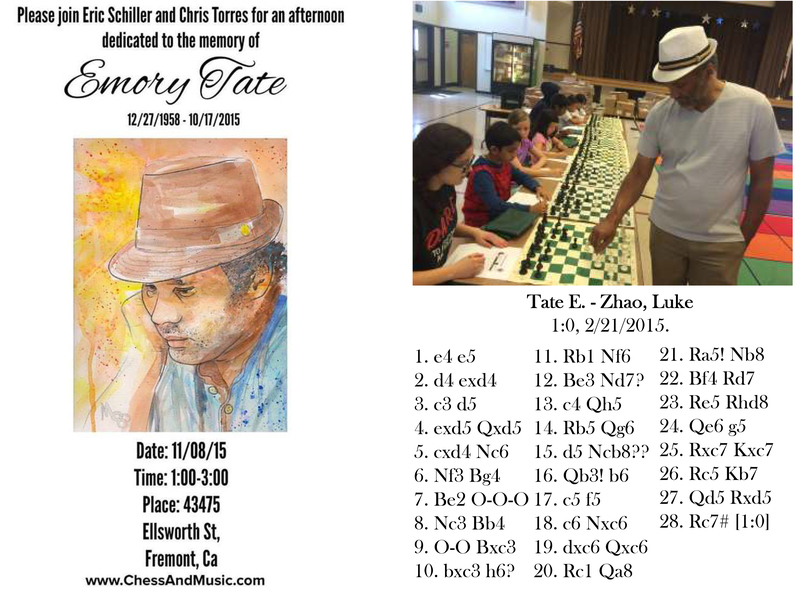 For the children who participated in his simultaneous exhibition chess event on July 10th, Emory Tate has achieved a legendary status. Nearly 50 opponents, many of whom are some of the top ranked young chess players in the United States, took on the famed International Chess Master simultaneously. 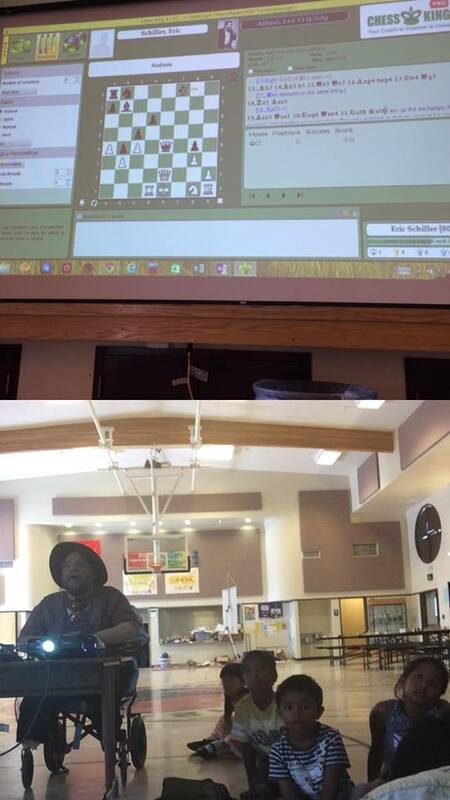 Emory Tate, who only had the white pieces in a few of the games, played for 5 hours and a walked nearly 2 miles while completing his simultaneous chess exhibition! During the course of this momentous task, Emory Tate emerged victorious on every single board. Beyond making it look easy, Emory Tate managed to make every child feel important. The gentleman behind organizing this event was the very famous chess instructor Chris Torres. 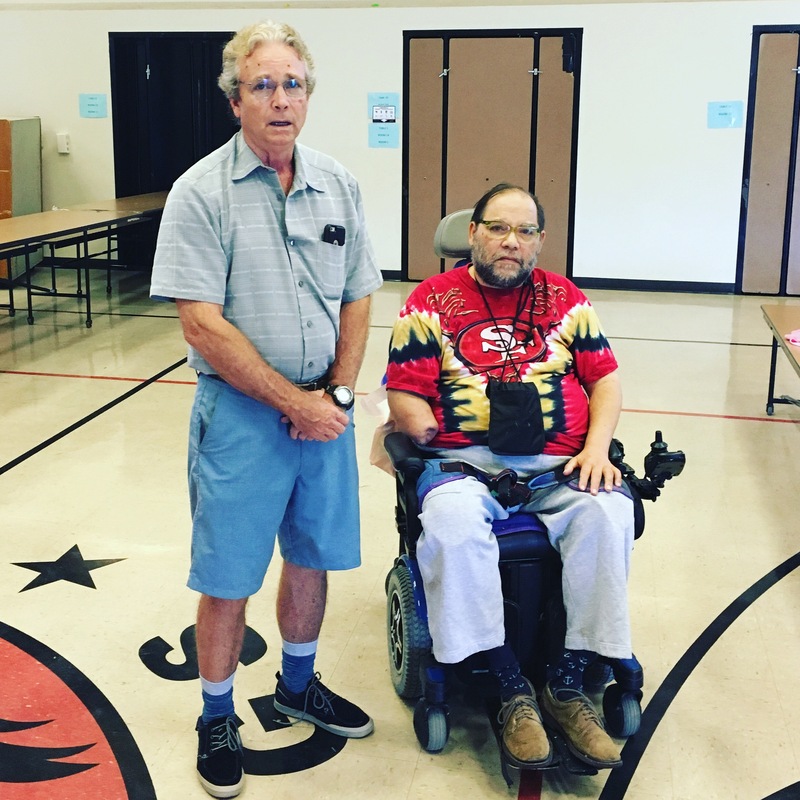 Mr. Torres is the founder of the Torres Chess and Music Academy which is very popular with the top scholastic chess players in Northern California. Every child who took part in the main event received one-on-one instruction following their game, an autograph from Emory Tate, a souvenir photograph of Emory at their board and the opportunity to learn from one of the strongest chess masters in the United States. 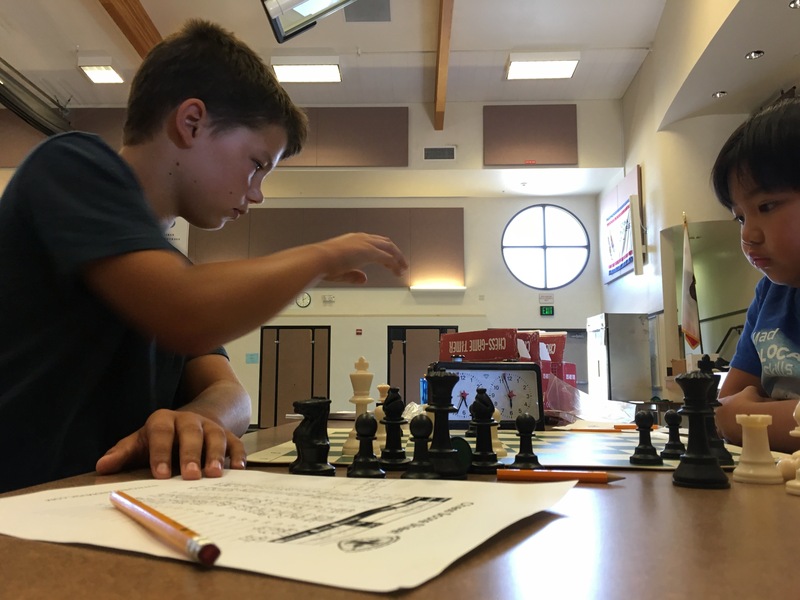 The Fremont Summer Chess Camp has two more weeks of classes and special events including a lecture from famed chess author Eric Schiller and a visit from Grandmaster Susan Polgar. For more information please visithttp://www.ChessAndMusic.com.